Malus 'Evereste' boasts dazzling, unusually large white flowers in April, opening from scarlet flower buds that fade to pink. Dark-green foliage adopts a yellow/bronze hue in autumn and attractive crab apples develop, flushed with shades of yellow, orange and red. These lovely crab apples can be used for culinary purposes or left on the tree where they will adorn the branches into winter. Conical in habit, Malus 'Evereste' will grow to a height and spread of about 5 x 4 metres in 20 years. Pollution tolerant, Crab Apple trees are suited to urban areas and can handle most positions and soil types. This Flowering Crab Apple is popular amongst wildlife, particularly bees, making it a reliable pollinator used in commercial apple nurseries. 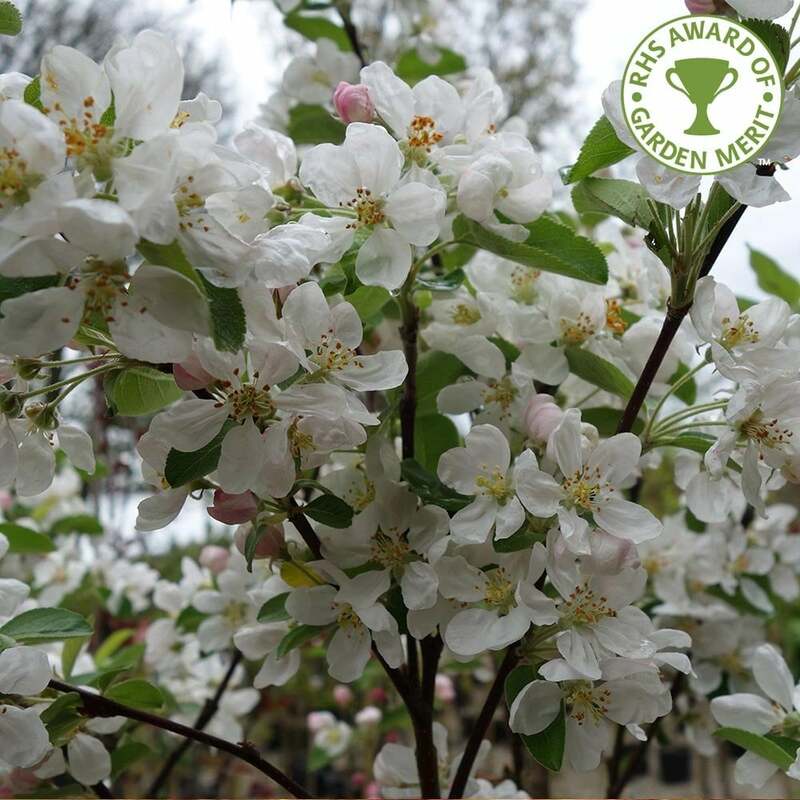 Malus 'Evereste' is named after Eve Reste, the person, not the Himalayan Mountain and holds the RHS Award of Garden Merit. Our pot grown Crab Apple Evereste trees can be planted at any time of the year. Start by removing weeds and grass within a metre of your desired planting hole. Dig a square hole as deep as your root mass and approximately 2-3x as wide. To help the tree establish more effectively, sprinkle root grow in the hole. Remove the pot, gently loosen the roots and place in the planting hole. Mix 50% of the original soil with 50% compost, fill in the hole and firm around gently. Avoid banking the soil up around the collar of the tree. We recommend planting Evereste Crab Apple trees (except multi stem forms) with a stake and tie kit to anchor the roots - instructions are in the planting guide. If you’re planting Evereste in spring or summer, water well for the first few months. Increase watering if there are extended periods of hot or dry weather. If planting in autumn, you may only need to water a little. Our range of watering kits make it easier. Crab Apple Evereste can be pruned in winter. They do not require hard pruning and you should not trim the tips of crab apple branches. Simply remove any dead or damaged branches and shoots at the base of the tree i.e. suckers and water sprouts which redirect energy resources from the main stem but do not produce strong branches.